Take Your Antioxidant Protection Up Another Level. 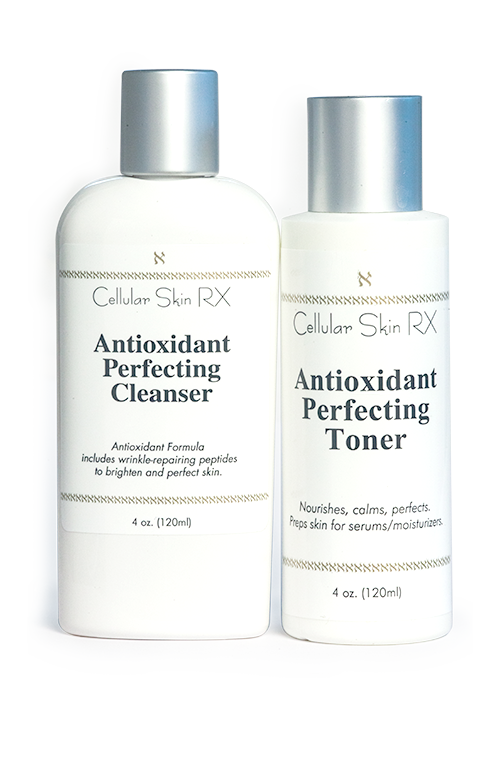 Defend your skin with CSRx Antioxidant Perfecting Cleanser and Toner duo. This powerful duo defends your skin against multiple environmental insults. Antioxidant Perfecting Cleanser uses anti-aging superstar, Niacinamide, plus Kakadu Plum Fruit Ferment to make the cleansing step in your routine particularly beneficial. Antioxidant Perfecting Toner adds a healthy dose of Ubiquinone to your skin to stimulate collagen and elastin growth. The result of using these two? Smoother, firmer skin protected, prepped, simply perfected! Wrinkle Relaxers. 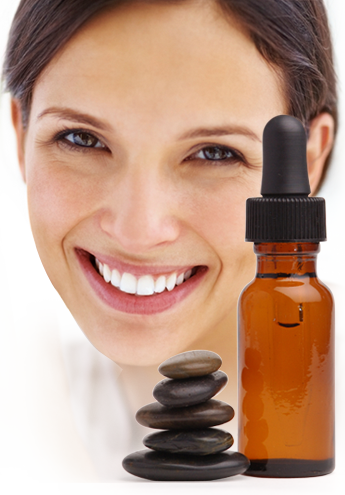 Antioxidant serums. Treatment Moisturizers. Beneficial Exfoliators, Cleansers and Toners. All brimming with clinically-supported Active Ingredients That Work™ so you get real, visible results. PLUS FREE in-depth, expert skin care consultations. Relax wrinkles. Firm and brighten skin. Prolong injection results. Increase cell turnover and collagen production. Repair, protect and prevent future damage with powerful antioxidants. We do the work so you can relax, sit back and enjoy a firmer, fresher, more radiant complexion. Modestly-priced, too. 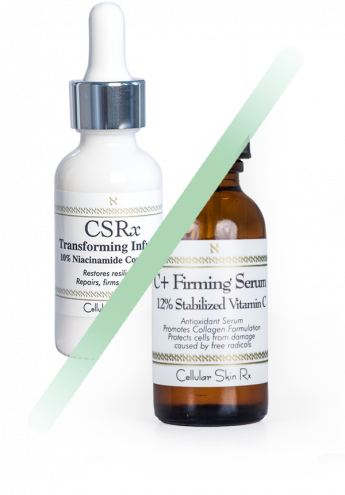 A fabulous power couple: Vitamin C+ Firming Serum and CSRx Transforming Infusion, 10% Niacinamide Concentrate. Your skin will be truly transformed! Buy together and save! ONLY $78.00. Get your Glow on! Our BEST-SELLING , water-free, vitamin C + Firming Serum is a 12% concentration of stable Vitamin C (L-Ascorbic Acid) in the correct 3.5 pH formula. This powerful antioxidant brightens and firms, improves texture and tone. Ramp up your collagen production! Then just sit back and wait for the compliments. You Glow, Girl! Is Niacinamide an anti-aging miracle ingredient? Bounce! Spring! If you dropped a penny on your cheek, what would it do? 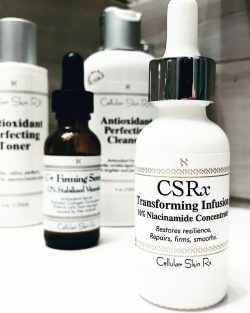 Get the resilience of younger skin with CSRx Transforming Infusion, 10% Niacinamide Concentrate. Repairs, protects, renews. Quickly, too. Transform your complexion now! Have a couple of minutes? Want a polished, glossy complexion? This active glycolic/lactic acid polishing peel will reveal fresh, new skin and leave you with a bright, polished look. Just call it a glossifier for your face. Spend $59 and get peeled and perfected for just $15. Use Coupon Code Peel15 at checkout. Save $21 now.